Another article in the same Kinsley Graphic newspaper (April 6. 1918) printed the text of Reverend Emmanuel Jones’ Liberty Day. He was the pastor of the Christian Church and well known for his speaking ability. I wanted to share his address with you, but thought I should try to find out a little more about him. Several long hours of research has revealed a very interesting life story. I warn you, it will take a few paragraphs to get him to Kinsley, World War I, and this speech in the South Park. Emmanuel Jones was born in Wales in 1872 and immigrated to Canada and here in 1891. He became a naturalized citizen and a minister/evangelist. He had relatives around Scranton, Pennsylvania and was living in Omaha, Nebraska in October, 1905. After much digging, I found mention of him traveling to Wales during the Welch Revival of 1905-06. 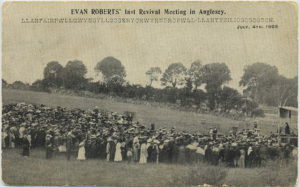 If you’re like me and have never heard of this, it was a Christian revival led by evangelist Evan Roberts in Wales. 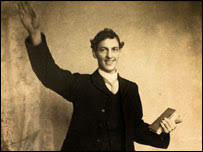 His revivals impacted thousands of people and turned then to prayer and godly living. Reverend Jones left Pennsylvania to evangelize in the west. On May 28, 1914 he was pastor of the Baptist Church in Wahpeton, ND when he married Margaret Miller in Kansas City. In the wedding announcement Rev. Jones is described as a Welshman who “has the fervency and zeal so characteristic of his countrymen.”(Wahpeton Times, May 28,1914). After he was married, he served several churches in the Kansas City area: Armourdale Christian Church (1914), Grandview Christian Church (1915) and Emerson Park Christian Church in Argentine Christian Church (1916-1917). In October, 1917, Rev. and Mrs. Jones came to the Kinsley Christian Church. I wanted to share what Rev. Jones’ said as it represents a speech by a local person in support of the war and Liberty Bonds. In times of war, patriotism runs high and this speech certainly exhibits that. Try to imagine the whole town turned out for the parade and the gathering in the park to hear patriotic speeches. This is before people had radios and televisions in their homes. Speeches were a form of news and entertainment. The weather must have been good as there was a contingency plan to meet at the Palace Theater if it were inclement. There is no record that a band gazebo existed, but there may have been. Or maybe the people sat in the wooden stands built at the park for ballgames and horse races. There were U.S. flags everywhere and the crowd has sung patriotic singing. Rev. Jones is the second speaker of the day. “When you see the Stars and Stripes displayed, stand up and take off your hat. Somebody may titter. It is in our English blood to deride all expression of noble sentiment. You may blaspheme in the streets and stagger drunken in public places and the bystanders will not pay much attention to you, but if you should get down on your knees in the street and pray to Almighty God, or if you should stand bareheaded while a company of old soldiers march by with their flag in the breeze, some people would think you are showing off. But don’t you mind. When Old Glory comes along, salute and let them think what they please. When you hear the band play ‘the Star Spangled Banner’ while you are in a restaurant or hotel dining room, get up, even if you rise alone, stand there, and don’t be ashamed of it either. For all the signs and symbols since the world began there is never another so full of meaning as the flag of this country. That piece of red, white and blue bunting means five thousand years of struggle upward. It is the full-blown flower of ages of fighting for liberty. It is the century plant of human hope in bloom. It means the answered prayer of generations of slaves, of the Helots of Greece, of the human chattels of Rome, of the vassals of feudalism, of the serfs of Russia, or the blacks of America—of all who whipped and cursed, have crawled from the cradle to the grave through all time. Your flag stands for humanity, for an equal opportunity to all the sons of men. Of course, we haven’t arrived yet at that goal. There are many injustices yet among us. Many senseless and cruel customs of the past still cling to us. But the only hope of righting the wrongs of men lies in the feeling produced in our bosoms by the sight of that flag. It stands for no race, it is not like an Austrian, Turkish or German flag – it stands for me—men of any blood who will come and live with us under its protection. It is the only banner that means mankind. It stands for a great nation on earth free from the curse and burden of militarism and devoted to the arts of peace. It means the richest, happiest, youngest people on the glove. Other flags mean a glorious past, this flag a glorious future. It is not so much the flag of our fathers as it is the flag of our children and all children’s children yet unborn. It is the flag of tomorrow. It is the signal of the ‘good time coming.’ It is not the flag of your king, it is the flag of yourself and for all your neighbors. It has a power concealed in its folds and swatters abroad an influence from its fluttering. That power and influence mean that in due time slowly and by force of law, yet surely as the footsteps of God, the last ancient fraud shall be smitten. The last unearned privilege removed. The last irregularity set right. The last man shall have a place to work and a living wage. The last woman shall have her rights of person and of citizenship, and the last and least of children shall be sheltered and trained and equipped by the sovereign state, and so have their right to live. Don’t be ashamed when your throat chokes and the tears come as you see it flying from the mast of a ship in the Bay of Gibraltar or the Port of Singapore, you will never have a worthier emotion. That flag is the cream of all religions, the concentrated essence of the best impulses of the human race; reverence it as you would reverence the signature of the Deity. By hundred and by thousands the wretched victims of the old world caste are streaming westward, seeking here the thing that flag stands for—opportunity. It stands for the quick against the dead, the youth of the world against its senility. This entry was posted in Uncategorized on April 9, 2018 by Joan Weaver, Kinsley Library Director.